160 athletes and 40 teams from Italy and Europe will compete in series of workouts (WOD) specifically created to push every athlete to its limits. 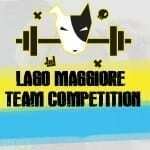 Strain, sweat and the desire to overcome our own boundaries… these qualities distinguish every Crossfitter who will take part at the Lago Maggiore Team Competition on June 6th 2015. A unique opportunity to take a closer look to a new sport which it’s gaining a lot of success worldwide.